A skein is a bundle of six-strand embroidery floss about 8 yards long. The skein is held together by small paper tubes on which the brand and color number are printed. DMC and Anchor are the most common embroidery floss companies. Embroidery floss can be made from materials including cotton, silk, and even plastic. The cut end of the floss is usually located on end that has the longer paper tube label (the one with the bar code). Finding this end, you can pull the floss carefully and it will come out of the skein without tangling. Avoid the cut end that is near or under the shorter paper band as it is located on the outside of the skein. Pulling on it will often result in a tangle. You can keep your embroidery floss in the original skein while using it or wind it onto bobbins. This is a good tactic as the identifying paper bands can come off as the skein is used, and different skeins can end up tangled together. Some stitchers cut their floss into usable lengths and attach these to a keyring with a larkshead knot. There are two main companies that produce most of the embroidery floss sold on the general market. In addition, there are many independent manufacturers. DMC floss is used the most in the United States. They offer several types of floss, from typical cotton floss to several specialty styles. Their variegated blends are very popular and are perfect making shadows for hair and for breaking up the old style of redwork (patterns worked in a single color). Satin flosses are also available at DMC. This floss can be a bit of a bear to work with. The colors and shine are brilliant but threading the needle and the unraveling is frustrating. The same goes for metallic floss. A thread conditioner product such as Thread Heaven or quilting wax can help tame these types of floss so they are easier to use. DMC also has memory wire floss that is great for 3-D effects. Anchor thread is seen more widely in European countries, but you can find it from U.S. retailers and online sites. Their floss is comparable to DMC, so much so that the majority of pattern makers will give you both Anchor and DMC numbers, and you can find conversion charts such as the one at Yarn Tree. Many stitchers who have used both Anchor and DMC say that Anchor is a bit softer than DMC and can sometimes be easier to work with, but it is not as strong. There are others that love the texture of Anchor and find DMC to be rougher around the edges. There have been many debates about whether DMC or Anchor is the best. These two floss brands are the heavy hitters in the cross stitch world and can be combined or substituted for each other. This comes in handy when you have both in your stash. They both produce excellent mainstream floss. 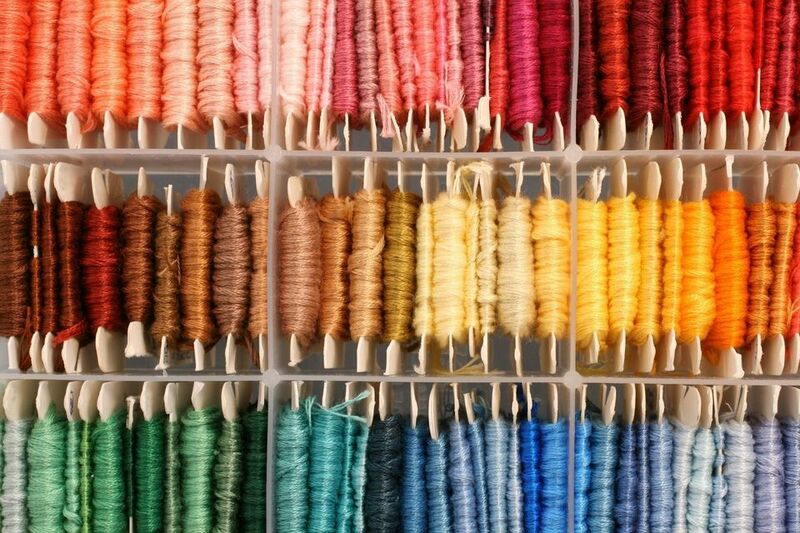 There are many indie designers creating and dyeing their own floss. Sublime Stitching has a rainbow, and then some, of beautifully colored floss. Another independent brand is Weeks Floss. They do small batch dyeing of floss. You can order just about any brand online, but be prepared to pay a steep price for higher quality, low run flosses. Also be aware that small batches of individually dyed floss will vary in color, so if you are planning a project with hand-dyed floss then get enough for the entire pattern. Otherwise, you may have a hard time matching the colors up.